World Water Day 2018, an event that is held every year on March 22nd, is about focusing attention on the importance of water. This year’s theme, “Nature for Water,” explores how we can use nature-based solutions (NBS) to help overcome the global water challenges of the 21st century. The 2018 campaign, “The answer is in nature,” raises awareness of NBS, such as reconnecting rivers to floodplains and restoring wetlands, as a cost-effective way to positively influence the water cycle, protect the natural environment, and improve human health and welfare. Nature-based solutions have the potential to help confront and overcome many of our most pressing water challenges, such as restoring forests, grasslands, and natural wetlands; enhancing water storage via natural wetlands, soil moisture, or groundwater recharging; and creating buffers of vegetation along water courses (called riparian zones). Taken together, NBS help address water availability and quality problems and usually involve the management of vegetation, soils, wetlands, rivers, and lakes—in both urban and rural areas. 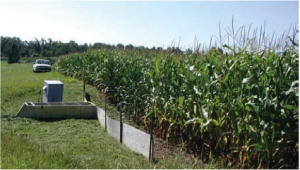 For example, water quality pollution from agriculture can be greatly reduced by NBS such as practicing conservation agriculture that protects soil from erosion, or establishing riparian buffers planted with native trees and shrubs. An excellent example of an NBS success story was provided through a partnership of farmers and regulators in Missouri, where atrazine (a popular herbicide used in cornfields) was significantly reduced in several nearby lakes used as a drinking water source by managing application and set-back distances (see figure). In Louisville, we utilized nature’s power of water purification to treat Ohio River water—a process known as “riverbank filtration.”1 In this process, water is purified by natural filtration and microbial processes that remove agricultural and industrial chemicals in a very cost-efficient manner. This process has been applied worldwide and even has a biblical reference (Exodus 7:24)! Although NBS are not a panacea to the global water-related challenges that arise as our population grows (see also text box), they can provide innovative and cost-effective (so-called “green infrastructure”) options for supplementing insufficient or aging, conventional (human-built or “gray”) water infrastructure. And while a great deal of progress has been made on NBS, there is need for additional research, such as around the performance, impact, and scalability of NBS. It is also important to emphasize that NBS can yield benefits beyond specific water-related services. For example, nature-based (constructed) wetlands used for wastewater treatment can also support energy production, improve biodiversity, and create recreational spaces in urban areas. 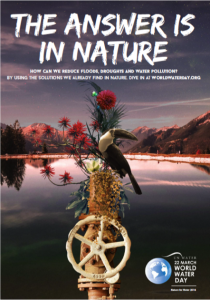 Nature-based solutions, especially when harmonized with conventional infrastructure wherever possible, are a key element of confronting growing global water challenges and improving public health and livelihoods. More specifically, NBS for managing water supply and quality also support the achievement targets of the United Nations Sustainable Development Goal (SDG) #6, to “Ensure availability and sustainable management of water and sanitation for all” by 2030. Nature-based solutions can also play an important role in meeting several other SDGs, including SDG 3: Good health; SDG 7: Affordable, clean energy; and SDG 11: Sustainable cities and communities. On behalf of my colleagues on the WQ&HC, we will enthusiastically support World Water Day in 2018 and beyond to help raise awareness of and inspire innovative solutions to growing global water problems that affect us all. 1The Louisville Water Company’s Riverbank Filtration Project won the American Society of Civil Engineers international “Outstanding Achievement in Civil Engineering” award in 2011 for its simplicity and innovation.